Hotel Solero** is waiting for its guests from the 1st of January, 2008, just int he heart of Siófok city. 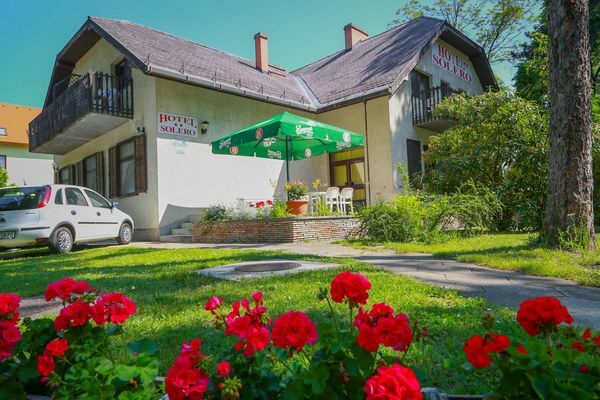 The hotel is located in the silent, peaceful Batthyány street which is probably the most romantic street int he town. We are less than 5 minutes by walk from the city centre, where You can choose from a wide selection of bars, restaurants to have fun. The railway station and the bus station is also less than 100m-s from the hotel. You can reach the lake through the city's most beautiful, recently renovated Park Jókai, the harbour is ca. 150m far, the same distance as the Petofi walkway, which is the centre of the summer life: plenty of bars, shops, restaurants, discotheques take place there as well as the Coke Club. In our hotel there are 18 2-3-4 bed rooms, all with separated bathrooms (shower, toilette), all the rooms are equipped with TV and fridge. In the ground floor the Solero Bar offers You drinks, and fast food. The hotel has a big garden, with garden furnitures, and closed parking places for the guests cars. Our guests get a special discount from the entrance fee of the Vértes**** Conference and Wellness Hotel's wellness department. The hotel is just on the other side of the street. Further informations You can find at the wellness menu. • Breakfast is not included in room rates. It is available at 1000 HUF per person. • Half board is available at 3000 HUF per person. • The hotel's own parking lot is available for the guests at 800 HUF per car per day.